Designed for high efficiency, energy savings and maximum user protection. Available in 48", 60" 72" and 96" width; 32" depth X 59" height. The aerodynamic face opening with airfoil provides uniform airflow into the fume chamber. 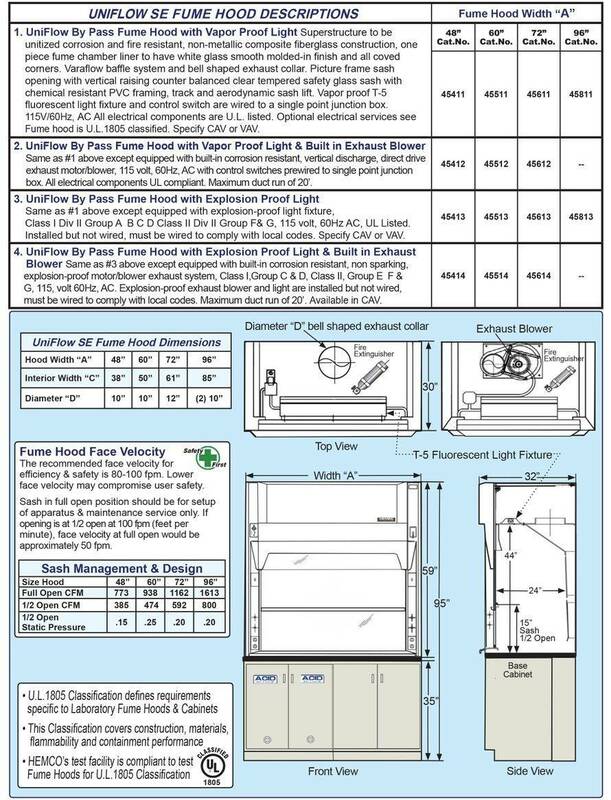 A constant volume low flow hood with VaraFlow baffle system efficiently directs the airflow through the fume chamber to the exhaust outlet with minimum turbulence. UniFlow Superstructure non-metallic construction (No Rust) for total chemical resistance, superior durability and long life. Interior fume chamber one piece glass smooth, all coved corners for ease of cleaning. Unitized construction reduces weight for ease of installation. 5 year warranty.Meets U.L.1805, and NFPA-45 classification with flame spread of less than 25 per ASTM E-84. VaraFlow Baffle System sash management provides for energy savings. 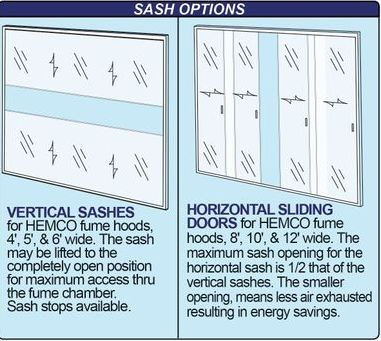 With sash stops at 1/2 open air flow is reduced by 50%. Energy Efficient fluorescent vapor proof T-5 light fixture with polished stainless steel reflectors, and light switch on left column, all factory installed. User Protection with sash in lowered position, fumes are kept safely away from the user. 29" Sash Height vertical moving sash for loading and unloading of fume hood. Angled Picture Frame Opening aerodynamic face opening with air foil provides uniform air flow into the fume chamber, & thru the VaraFlow baffle system, to the exhaust collar. Full 36" Viewing Height for ease of access and unobstructed view of fume chamber and working with tall apparatus & distillation grids. 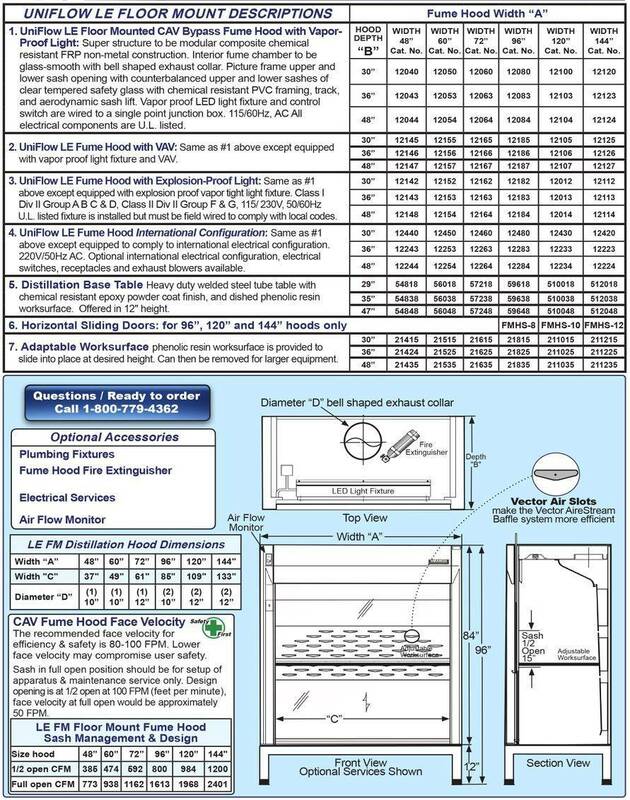 Airflow Monitor OSHA recommends all fume hoods be equipped with an airflow monitor. 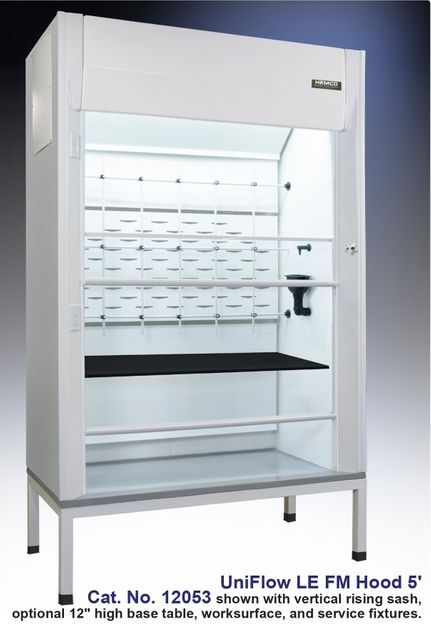 Full duty fume hoods in space and energy saving sizes of 30", 36", 48", & 72" widths. UniFlow CE models are low flow constant volume fume hoods that require no VAV controls, no motorized baffles, no costly auxiliary air system and no special integral supply fans. 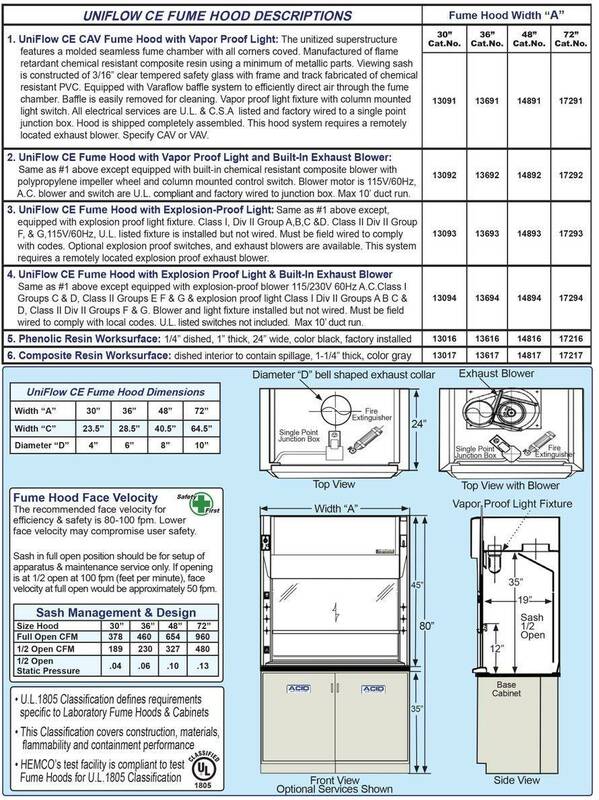 These units can save 50% or more in costly exhaust volume typically required to operate a conventional fume hood. 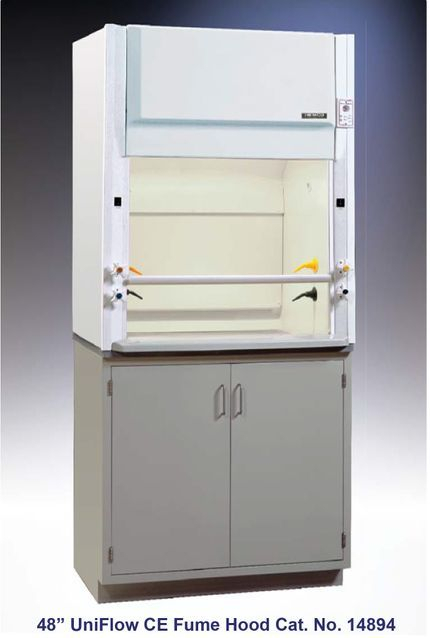 Fume hood is U.L.1805 classified. UniFlow Superstructure non-metallic construction (No Rust) for total chemical resistance, superior durability and long life. Interior fume chamber one piece glass smooth, all coved corners for ease of cleaning. Unitized construction reduces weight for ease of installation. 5 year warranty. High Efficiency sash management provides for energy savings. Energy Efficient two-tube vapor proof fluorescent light fixture, & light switch on left column, factory installed. 23" Sash Height vertical moving sash for loading & unloading of fume hood. Sash is counterbalanced and connected with coated stainless steel cables, 3/16” tempered safety glass with chemical resistant non-metallic PVC framing track and aerodynamic ergonomic sash lift. Sash lift contoured for efficient air flow and ease of movement, standard equipment. Full 27" Viewing Height for ease of access and unobstructed view of fume chamber while working with tall apparatus and distillation grids. 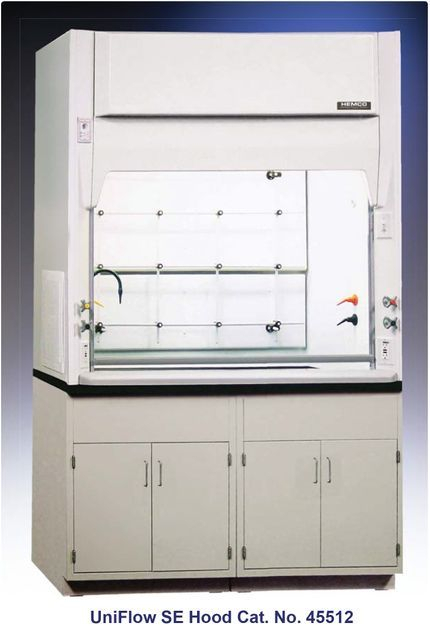 U.L.1805 Classification defines requirements specific to Laboratory Fume Hoods & Cabinets. This Classification covers construction, materials, flammability and containment performance. 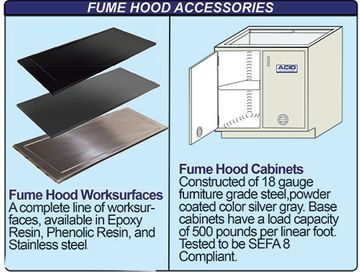 HEMCO’s test facility is compliant to test Fume Hoods for U.L.1805 Classification. lift. VaraFlow Baffle System maintains uniform airflow thru the VaraFlow baffle system to bell shaped exhaust collar outlet. Sash Stop located at 1/2 open to reduce airflow 50%, standard equipment. Electrical Services can be mounted on right or left side. Plumbing Services fixtures are color coded to specific service. UniFlow LE FM Floor Mounted (Walk-In) hoods are ideally suited for synthesis, distillation & other rack type operations where tall apparatus is used or equipment is rolled into the work area. In widths 48”, 60”, 72”, 96”, 120" & 144" and depths of 30”, 36”, & 48”. UniFlow Walk-In hoods are available in standard or special sizes to meet various applications. Modular construction can be shipped disassembled for on-site assembly. UniFlow Superstructure to be non-metallic FRP composite construction for total chemical resistance (NO RUST), superior durability and long life. Interior fume chamber to be glass-smooth with Vector Baffle System & bell shaped exhaust collar. Modular construction reduces weight for ease of installation.Includes 5 year warranty. UniFlow AireStream Vector Baffle System Features Vector Air Flow Slots for low flow and high performance. Maintains uniform airflow thru the baffle system to bell shaped exhaust collar outlet. 62” Sash Height for viewing of fume chamber, loading and unloading equipment for set up. Includes upper and lower sash. 76” Stand Up Height for ease of access and interior depths of 30”, 36”, and 48” available. With sash in lowered position, fumes are kept safely away from the user. 68” Viewing Height Double Vertical Sash provides ease of access for apparatus set-up in fume chamber. Sashes are perfectly counter balanced, 3/16 tempered safety glass, coated stainless steel cable with stainless steel pulley assembly. Framed in non-metallic PVC framing, track, and aerodynamic sash lifts for ease of movement and air flow efficiency. Horizontal sliding doors are available on 96", 120" and 144" wide models. Angled Picture Frame Opening aerodynamic face opening with air foil provides uniform air flow into the fume chamber, & thru the Vector AireStream Baffle System, to the exhaust collar. Air Flow Monitor (Optional equipment) continuously monitors face velocity air flow, meets ANSI and OSHA requirements.